As you may have gathered by now, I am a big fan of Your Next Stamp, I just can’t get enough of their products. What makes them stand out to me is the clean and fun images, they are so easy to colour and they bring out the (amateur) designer in me! The bi weekly card sketch challenges have helped me look at how I make my cards and given me the starting point I needed. Up until recently, I had never used card sketches and the cards I made were alright but I was never sure if they were balanced and quite often I wondered if they needed something else to complete them. This is the 3rd challenge I have entered and I feel that I am improving with every new sketch. The Your Next Stamp Design Team are all very accomplished and talented card makers and I get a real buzz seeing their creations and watching the videos! I used two monsters from the ‘Silly Monsters 2’ stamp set (CYNS126) and coloured them with Spectrum Noir Markers. :>) So glad that you like the sketches!!! Whenever I create them I always have something in mind for a finished card and I so enjoy seeing how everyone else interprets the sketches. 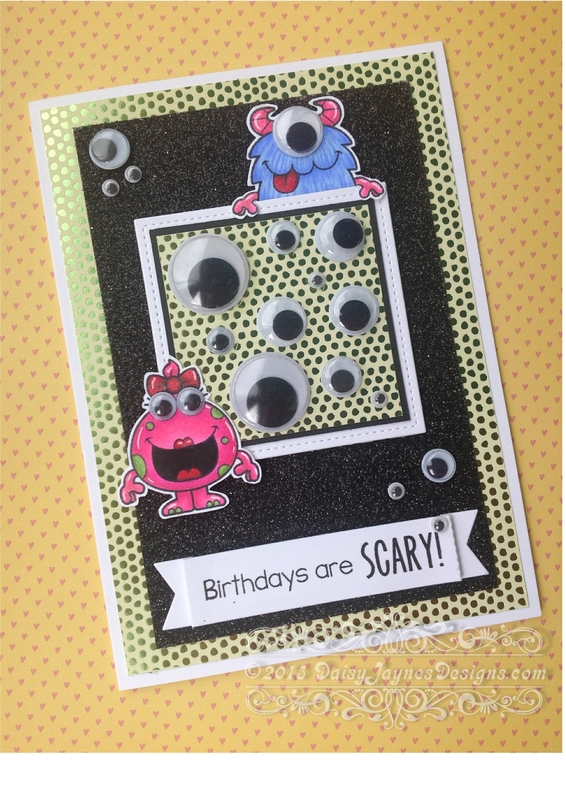 Your card is so fun with the monsters peeking over and all the eyes – what a great way to pull in all the circles. Fun stuff!